The User Dashboard gives employees the answers they need to reduce calls to your HR Department. It also serves as their singular portal to all their HR related information. No matter what solutions (payroll, benefits or other) you use today or decide to switch to next year, your employee’s will always have the same simple customized web address to go to. The dashboard layout and the modules you want to display to your employees is up to you. You can start slow and roll out sections of HRSoftware.me over time or take full advantage of all modules from day one! The dashboard is a simple and intuitive design that strategically captures your employee’s attention focusing them on select areas of their profile allowing employees to assist you with keeping information current. HRSofware.me manages those changes alerting HR admins for approvals on some changes and adding them to lists of changes for payroll and other benefits related information giving your HR department a single place to go to collect the most recent employee information and updates as well. The Open Positions, Company Announcements, Celebrations and Who’s Out modules help to create company culture and improve communications for the entire company. The Links Module gives quick and easy access to any HR related solutions you might offer to employees. The Documents module makes access to company documents you want your employees to have access to a breeze! The Time Off module enables time off requests and information updates to be handled by employees and approved by anyone in your company you designate. And because your employees have a single portal for every aspect of their HR needs they become very familiar with it reducing calls even further. And managing time off requests is just as simple even if there are multiple people involved for approving time off. HRSoftware.me allows you to set up your approval process in advance so when a request comes in, approvers are notified. On an employee’s first visit to any area of HRSoftware.me a “Tip” pops up giving them quick insight to the section they are in . The dashboard is no different and it also includes a “Getting Started” section which optionally shows a quick video as well introducing the employee to the basics saving you time on training. The Benefits module on the User Dashboard prominently displays the employee’s benefits they are currently enrolled in, have waived and are eligible for. It can also display the amount the employee pays for those benefits and can “optionally” display the amount your company pays on their behalf. Showing employees the amount your company pays monthly may prove to increase their appreciation and loyalty to your company as most employees don’t realize how high costs are. 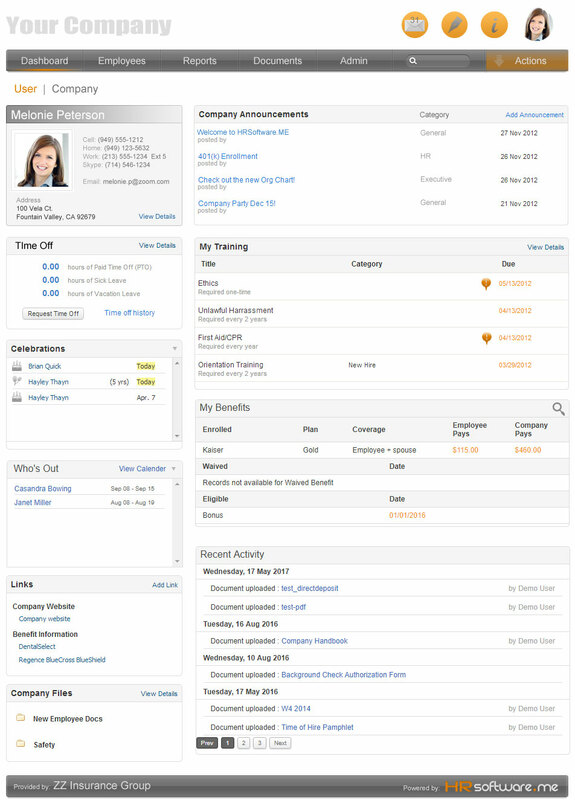 The Training module quickly shows employees upcoming or overdue training necessary. So often, required training is overlooked or just forgotten as busy as it gets. HRSoftware.me can assist you by automatically alerting employees and admins of required one time or recurring training and keeping records of completion for your entire workforce.